DE WIT -Regni Poloniae et Ducatus Lithuaniae, Volinae, Podoliae, Ucraniae, Prussiae et Curlandiae . . .
DE WIT, F - Regni Poloniae et Ducatus Lithuaniae, Volinae, Podoliae, Ucraniae, Prussiae et Curlandiae . . . Title : Regni Poloniae et Ducatus Lithuaniae, Volinae, Podoliae, Ucraniae, Prussiae et Curlandiae . . ..
Map maker : DE WIT, F.
Size : 20.5 x 23.7 inches. / 52.0 x 60.3 cm. 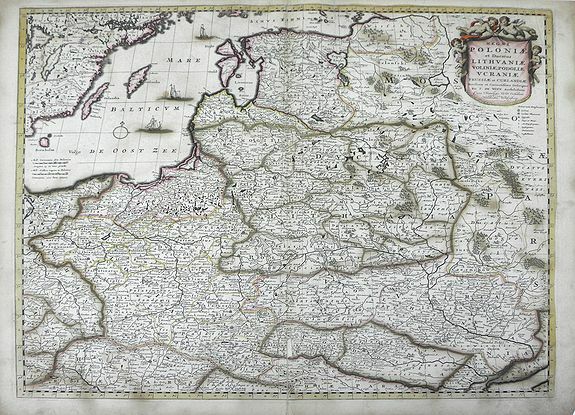 Description :Finely detailed map of the Baltic Sea region, including the regions of Poland, Hungary, Prussia, Ukraine, eastern Germany, and southwest Sweden by Frederick de Wit. Villages, lakes, rivers, marshes, mountains and forests are depicted. The title cartouche is held aloft by a host of putti and small ships sail the Baltic Sea. Vibrant, original color. Frederick de Wit, Sr. was the founder of a prominent Dutch family firm of three generations of cartographers working in Amsterdam. The firms output was prolific, and de Wit maps are often found in atlases by other cartographers. During his long working life, de Wit published 124 land maps and 27 sea charts that were distinguished by their high standard of workmanship, beauty, accuracy and fine coloration. The maps are typical of the style of the period, being completely executed and decorated with cartouches. The founder's son, a skilled mathematician and grandson together carried on the work of the firm, and published 130 maps, although the business did not survive for long after the elder de Wit's death. Condition : Slight brown toning of paper due to age; areas of brown staining and discoloration throughout; the center crease has been reinforced.